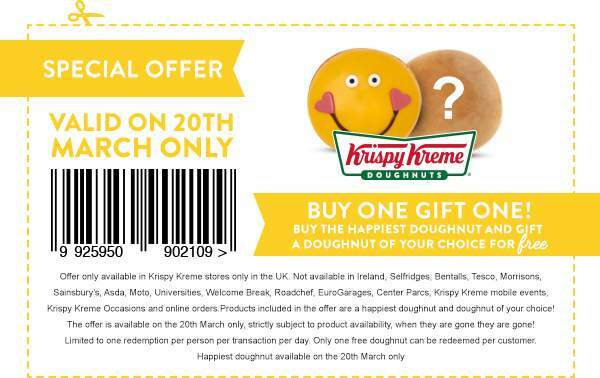 At Krispy Kreme we love to make people happy and what better way to do that on the international day of happiness 20th March, than with the Happiest doughnut - filled with our signature Kreme and decorated with a smile! In celebration of the International Day of Happiness, we are giving you the opportunity to share the happy even further, by giving you a free doughnut of your choice when you buy our happiest doughnut. 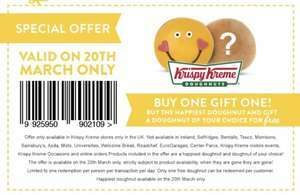 This offer is available in Krispy Kreme stores on Wednesday 20th March only *Terms and conditions apply. Simply go into store with your card or this email to redeem this offer.